One Sunday with nearly unlimited time and space on track gave way to another featuring perhaps the most frantic two hours of the entire NEO season as part of the two-round pre-qualifying process being used for the first time this year. NEO’s first ever pre-qualifying race had the length and intensity of a sprint race with the desperation of a championship-deciding season finale. Perhaps the excitement in the race was no surprise, as for the teams involved, it would be their final chance to prove they belong on the grid for the coming season. That race followed two weeks after the traditional pre-qualifying event in which teams put in short five-lap stints of hot laps to determine who was fastest around the Silverstone circuit. Based on those results, the initial group of 71 entries was pared down to 55 for what proved to be a highly competitive conclusion to pre-qualifying that would set the remaining three-quarters of the season-five grid. The leader among LMP1 teams in the first pre-qualifying session was SimRC.de Emerald — a veteran in NEO’s GT field looking to move to the top prototype class. Their combination of Claudius Wied and Simon Grossmann put in an average lap time more than eight tenths quicker than second-place BerlinSimSport in PQ1. 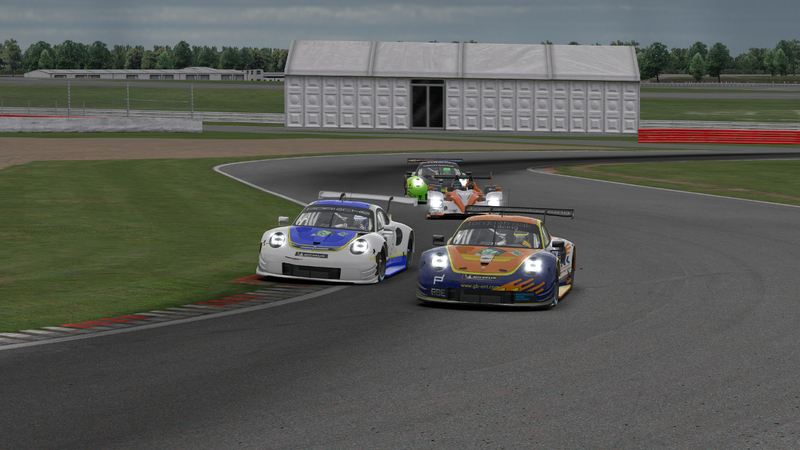 In qualifying before the PQ2 race, SimRC again topped the field, but this time, their competition was closer. Sorg eSport Yellow closed the gap to just two tenths, and they proved to be a stronger opponent than many might have expected from a NEO newcomer. 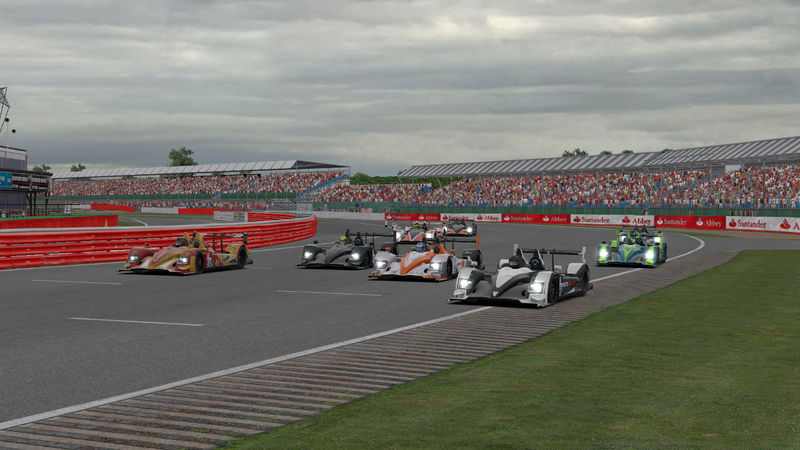 SimRC leads the field to the green flag to start the PQ2 race. Before the battle heated up at the front of the field, it was bunched up further back at the start of the race. 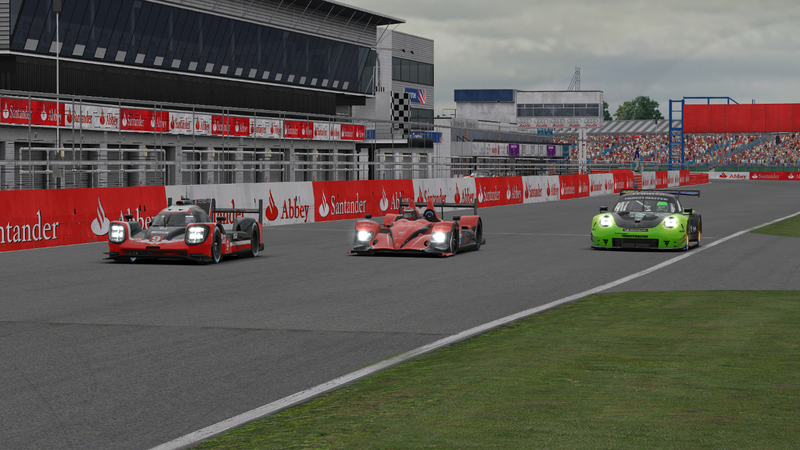 A mid-field check-up in the LMP1 pack saw contact between UI1-Positive Sim Racing Green’s Doriano Ricchiuti, VRTeRacing LMP’s Ryan Parkins, and SimExperience Element Sim Racing Fire’s Nils Hundehege. Ricchiuti got the worst of the incident, nosing his Porsche 919 into the wall before even reaching the green flag. However, he and teammate Yannick Ongena made the strongest recovery of the trio to finish inside the top ten. 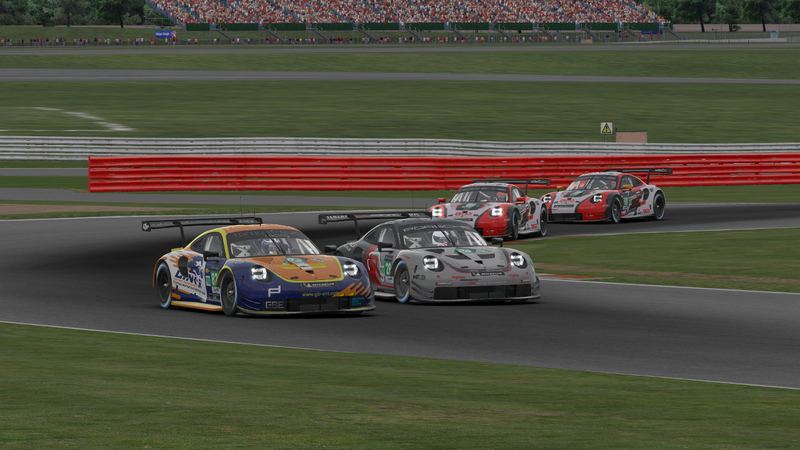 After a busy first stint of negotiating traffic, Sorg took the lead from SimRC during the first round of pit stops, but the fight wasn’t over yet. 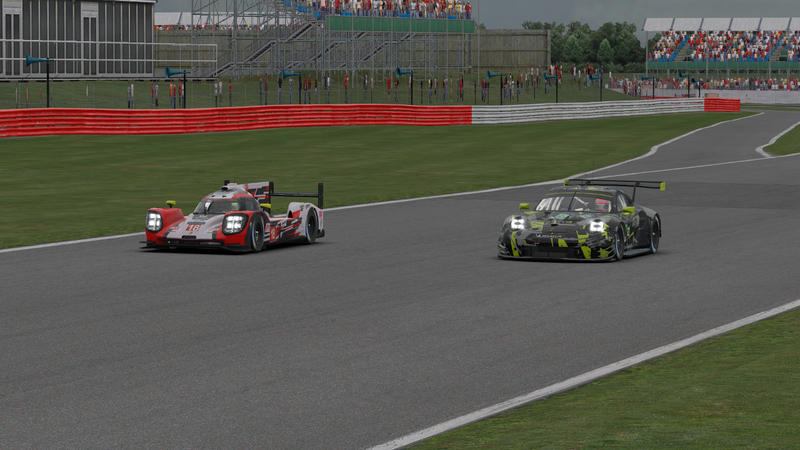 On lap 40, a near-spin for Sorg after contacting the Torque Freak Racing Sunset car in Copse allowed SimRC’s Grossman to drive around the outside and re-take the top spot. Sorg and Torque Freak slide while SimRC prepares to re-take the lead. But just four laps later, a slow lap including some contact for SimRC allowed Sorg’s Florian Krüger to move back to the front, and this time, he was there to stay. With some front-end damage, SimRC faded and at one point were more than 24 seconds behind. In the closing laps, Sorg’s Mike Nürnberg went into cruise control. While their final margin was less than 2 seconds ahead of SimRC, they still came away with the class and overall win in NEO’s first pre-qualifying race. Behind them, the best late-race battle was for third place — the final guaranteed transfer position for clean-driving teams. 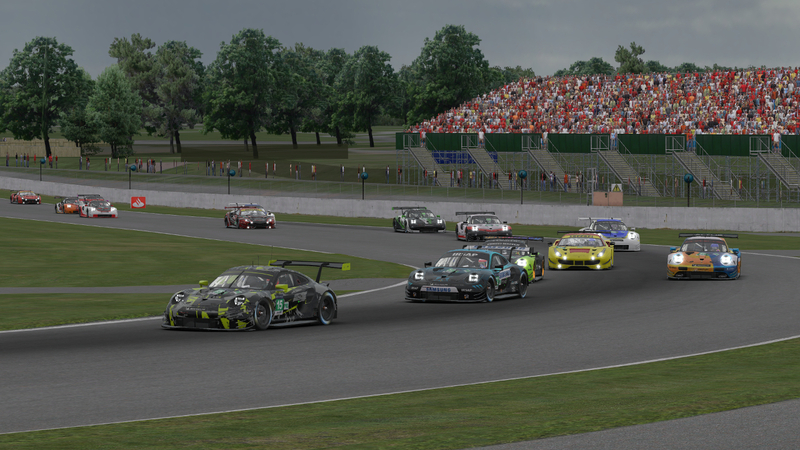 BerlinSimSport held the position for most of the race, but Odox’s Carlos Villegas closed in and made the pass exiting Stowe corner on Jurian Groenen with just two laps remaining. Odox makes a late pass on BerlinSimSport. In total, 11 of the 15 LMP1 teams that attempted PQ2 have been invited to join NEO’s season-five field. The podium finishers Sorg eSports Yellow, SimRC.de Emerald, and Odox Motorsport Samsung indeed received automatic invitations, and BerlinSimSport’s late drop to P4 still left them safely in the lineup. The rest of the top ten finishers, including SimatoK eSport Ambre, Wyvern Racing Blue, F4H Motorsport Bico de Pato, Race Clutch, Torrent Motorsport, and UI1-Positive SimRacing Green, also advanced. The final team selected was VRTeRacing, who was involved in the starting-line bump-up but made it to the finish in eleventh position. They will round out NEO’s inaugural LMP1 class. With none of the Audis entered in pre-qualifying advancing to the grid, that means just one Audi R18 e-tron quattro, driven by Virtual Motorsport, will be on track this season in the LMP1 class. While its demotion to NEO’s middle class made some believe there wouldn’t be as much action in the HPD this season, the close racing in PQ2 has already proven that’s not the case. From the start, the LMP2s were ready to race, with a four-wide battle down the frontstretch on the first lap. Schubert Motorsports’ Moritz Fricke initially gained several positions in that battle, but the outside lane didn’t have much grip in turn 1 and he spun off course, dropping to the back of the pack. 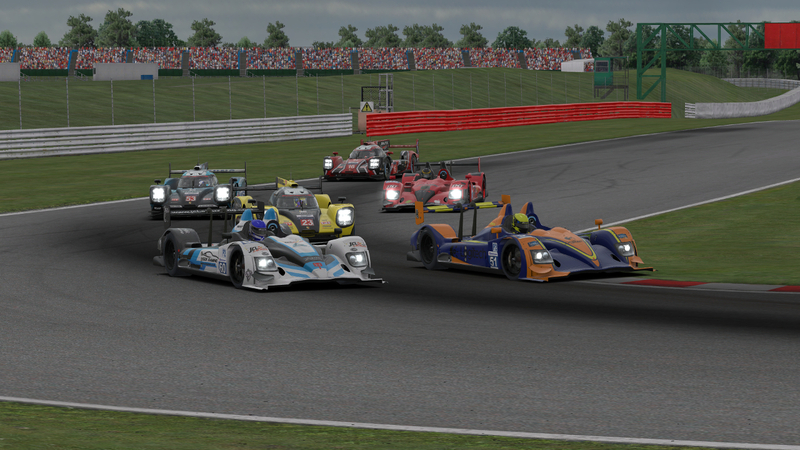 Four-wide action among the LMP2 field at the start of the race. Up front, polesitter and PQ1 pace-setter Yohann Harth didn’t put a wheel wrong in the Race Clutch HPD in the first stint of the race, and he pulled several seconds ahead of second-place Team Heusinkveld. While the middle of the race was mostly calm in the LMP2 field, it became home to the best battle on the track — and the most unpredictable turn of events — in the race’s final 15 minutes. It began with a five-way fight for second place. Team Heusinkveld held the position but AVA Simsport and Apex Racing UK were within striking distance, as were the charging drivers of Ronny Nunez for Torque Freak and Benjamin Lindsay for TNT Racing. 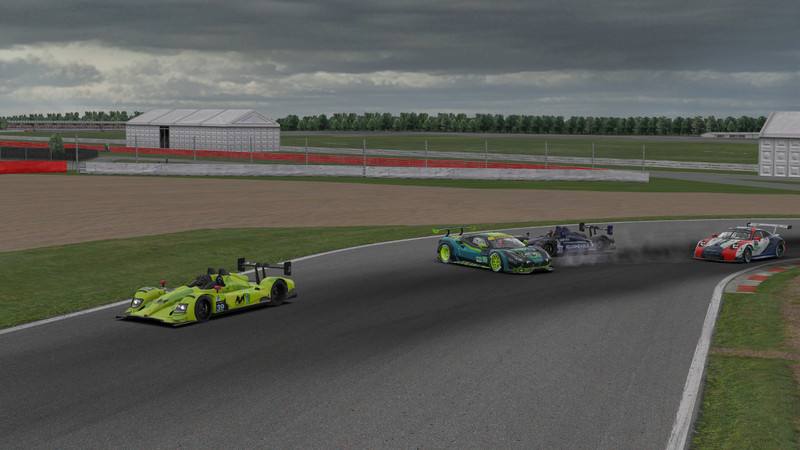 AVA drives away from an incident behind involving Team Heusinkveld. With seven minutes to go, those LMP2 combatants encountered heavy traffic exiting Club corner, and AVA’s Pascal Stix passed Gunnar Miesen for the second spot. In the next corner, the Ferrari of Inertia SimRacing spun sideways just ahead of Miesen, forcing him off track to avoid a crash and dropping Team Heusinkveld back to sixth. Nunez then chased down Stix and moved Torque Freak up to second place. It appeared that was where they’d finish, but then last-lap drama struck the class leader. 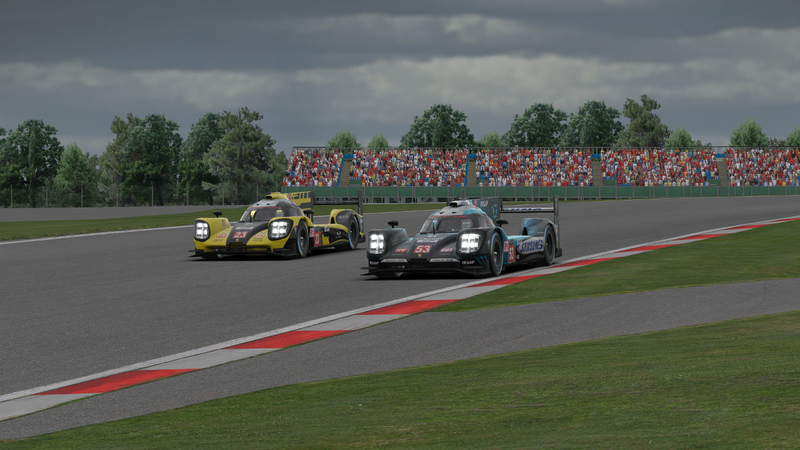 Race Clutch’s HPD ran out of fuel midway through the lap, erasing their big lead and dropping them off the podium into fourth place at the finish. Torque Freak Racing Skyline, which placed just 12th in PQ1, took advantage of the misfortune ahead of them to claim an unexpected PQ2 victory over AVA Simsport and Apex Racing UK. With those results, all three teams have automatically qualified for the field this season. Torque Freak and Apex Racing UK battle side-by-side into Vale. In fact, all 15 LMP2 teams who raced in PQ2 have been invited to join the grid. That includes Race Clutch and TNT Racing, along with the Team Heusinkveld entry that survived a hectic ending to the PQ2 race. Seventh- and eighth-place finishers World of SimRacing Team and Schubert Motorsports will make their NEO debuts in season five, along with SRN Motorsports’ first foray into NEO’s prototype class. Matching the result of their LMP1 team car, the UI1-Positive SimRacing Orange team finished PQ2 in tenth. 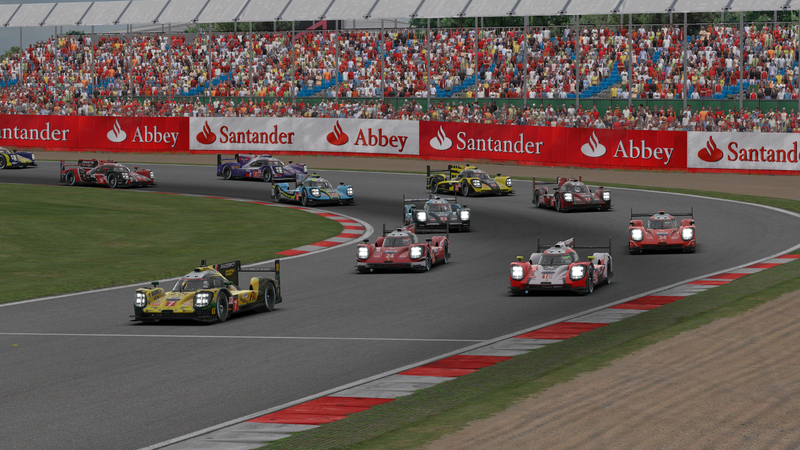 Finishing eleventh through fifteenth but also advancing out of pre-qualifying were Team MAD, RoadBasterds, Inertia SimRacing Corsac, RacingCenter – VIB3SPORTS, and iRacing Today Motorsports. The GT field was incredibly close in PQ1, with just 1.1 seconds separating the class-leading Altus Esports team from Torrent Motorsports, the final team to transfer to PQ2. With such a tightly packed lineup, it was no surprise that the pre-qualifying race provided wheel-to-wheel battles from start to finish. After some contact in the prototype pack ahead, the GTs made a crowded but clean getaway with just one first-lap incident when Geodesic Racing Black’s Miguel Vigo spun off course by himself in the esses. Team Eighty-Five leads the GT field on the first lap. The first round of multi-class lapping saw some close calls between prototypes and GTs, including a bump from one of Wyvern Racing’s LMP1 cars that sent the fifth-place Redface Racing Ferrari bouncing through the grass and spinning off course. 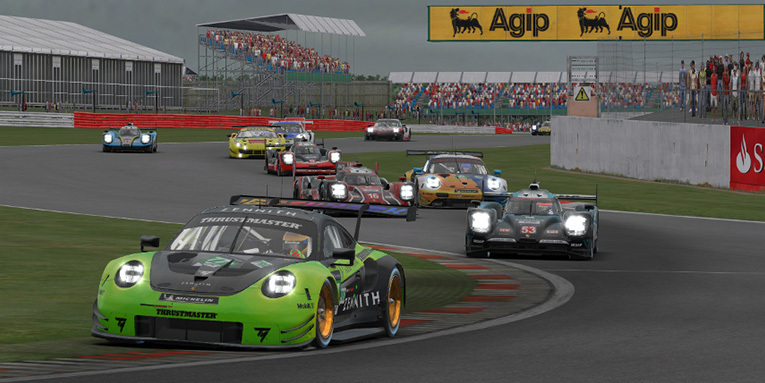 Aided by traffic plus plenty of raw pace in the Porsche, polesitter Lukas Jestädt of Team Eighty-Five pulled away to a 10-second lead over second-place Odox Motorsport IRSAP before the only round of GT pit stops. Behind them, though, there were several close fights for position. Altus challenged TRITON Racing for third place, SimatoK eSport got around Euphoria Racing for fifth, and MSI eSports #75 and ZENNITH eSport fought for seventh. 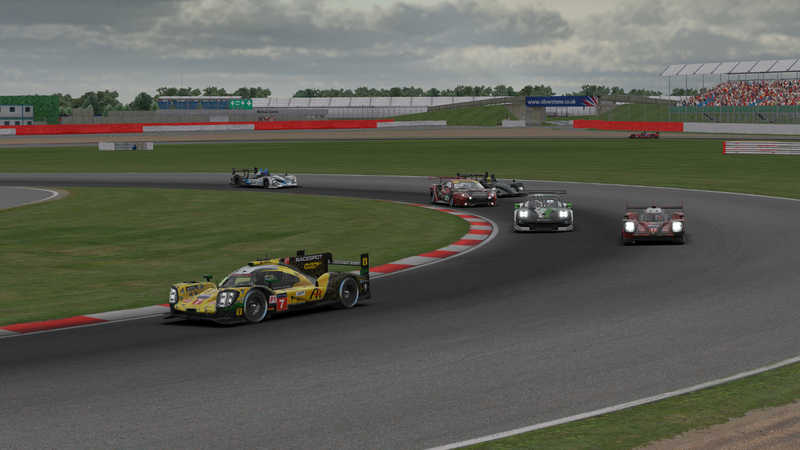 ZENNITH’s Carlos Diegues leads a pack of traffic through the esses. That fifth-place battle eventually converged into a multi-car scrap, with Torque Freak Racing Raidillon at the hands of Tim Claessens looking to match the late-race surge of their LMP2 teammates. While the Torque Freak car started the race in 16th, they were up to eighth by the start of Claessens’ stint, and he remained the car on the move until the checkered flag. Despite Silverstone’s reputation as a track where it’s tough to pass, Claessens had no trouble getting the job done, first into Stowe as he passed ZENNITH for sixth place, then just two laps later around the outside of MSI in Abbey. Torque Freak completes the pass for fifth place exiting the Abbey chicane. The battle behind Claessens came down to the final laps, with ZENNITH’s Erick Goldner getting past MSI’s Adria Perez with just two laps to go for a well-earned sixth place result. At the front, Team Eighty-Five’s Gregory Tanson cruised home to score the victory with Odox Motorsport IRSAP in second and TRITON Racing in third. The top-placed Ferrari belonged to SimatoK eSport Emeraude in fourth. All four teams were selected to participate in season five. Among the 25-car GT field in PQ2, just 14 teams in total were chosen to join NEO this season. Series co-founder and director Niel Hekkens said the selection process in the GT class came down to more factors than just finishing position. Claessens’ drive to fifth place earned Torque Freak Racing Raidillon an invitation to season five, but their teammates in the ninth-place Torque Freak Racing Corkscrew Porsche were not selected. GT class winner Team Eighty-Five alongside LMP1 and overall victor Sorg eSports. Hekkens said that due to the level of demand and competition, series officials decided to limit teams to one entry advancing per class from pre-qualifying unless “both cars demonstrated race pace and performance that was exemplary”. This season, that caveat did not come into play. “For a variety of reasons, coupled with just how closely packed it was for the final spots, we did not see this exemplary performance surface,” said Hekkens. Several other teams had one entry selected and one left on the reserve list. Joining Sorg eSports’ race-winning LMP1 team in NEO this season will be the Sorg eSports Red Porsche, while their stablemates in the Sorg eSports Orange car were denied an invitation. Despite their early incident in LMP traffic, the Redface Racing by MXS Engineering & JRT Ferrari were also selected while their tenth-place teammates in the Redface Racing by Bobolide.com car did not advance. Torque Freak Racing Corkscrew and Team SloRacing both failed to advance out of PQ2. Three other top-ten finishers have been given the green light to race this season. The battling duo of ZENNITH eSport and MSI eSports #75 were both chosen along with Team Buschfink Racing Pink. Thirteenth-place Team Army Racing were also selected. The final invitations in the GT class went to teams who had trouble in PQ2 but never gave up and showed the pace needed to compete in NEO. 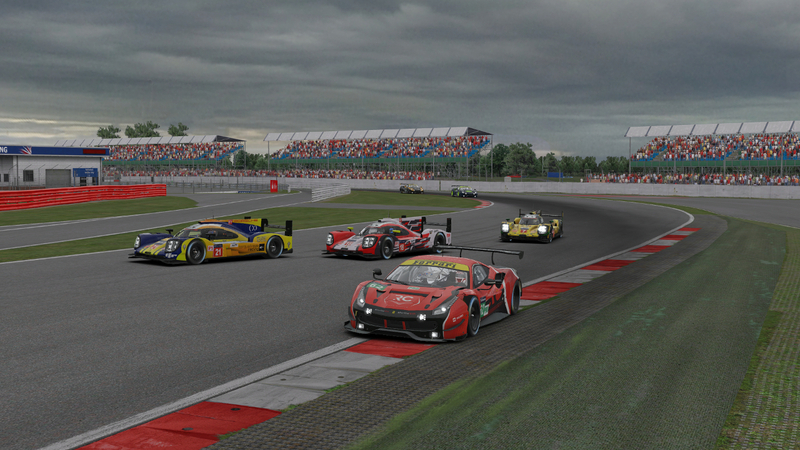 Despite finishing 22nd through 24th, Torrent Motorsports GTE 1, Altus Esports, and Euphoria Racing had their perseverance pay off with a berth in season five. The full list of teams to earn invitations, along with the reserve lists for each class, can be found in the official PQ2 results document. If all invited teams accept their invitations, this season’s 21-car GT class is set to include 14 Porsches, five Ferraris, and two Ford GTs, as the already-registered Thrustmaster Mivano Racing and CoRe SimRacing made a late switch to the blue oval. Multi-class racing through Luffield corner. The PQ2 event saw the return of a historical NEO procedure and the debut of a few new ones. Before the race, the starting grid was determined in an open qualifying session with 20 minutes on track for each class. 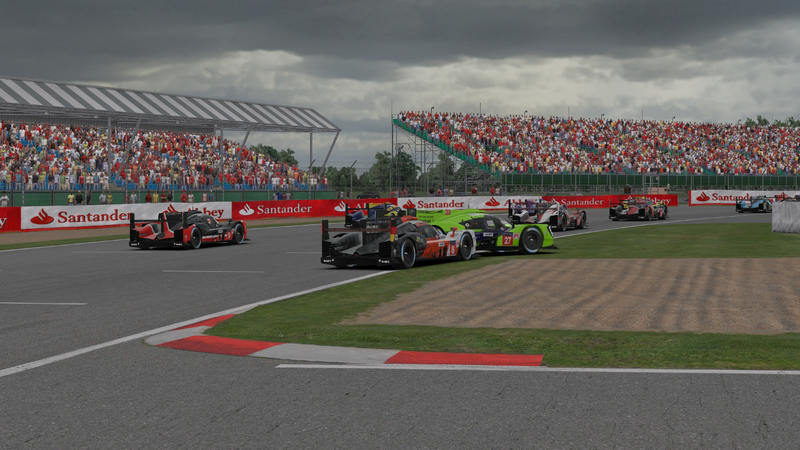 And the race itself began with a “big grid” rolling start rather than separate green flags for each class. Hekkens cautioned that it was too early to tell whether either of these rules would be tweaked before the field heads to Sebring next month. 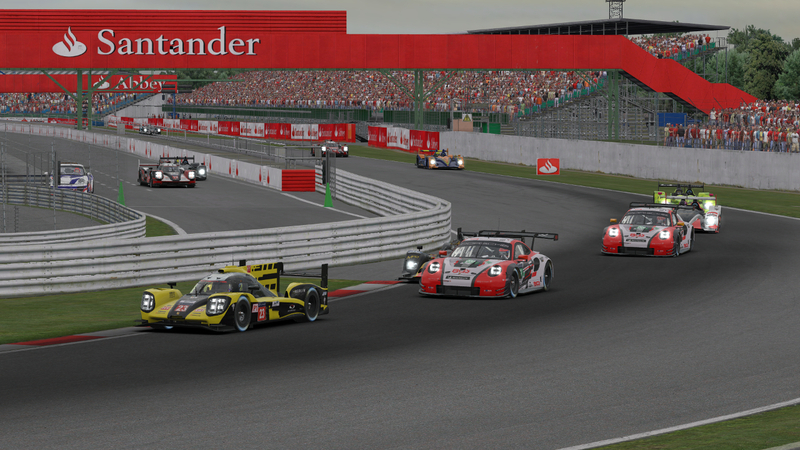 Contact at the start of the race in the LMP1 field. The PQ2 race was also the first test of the new automated incident tracking and penalty system, and Hekkens said “it exceeded our expectations”. Two teams received penalties for earning 14 or more off-track incidents in the two-hour race, while 37 teams received warnings for accruing at least seven off-tracks. Hekkens said series officials would evaluate whether this limit was too strict or too lenient, but he noted that it may not change much from the PQ2 race to the longer regular-season races. Off-tracks weren’t the only incidents keeping race control busy on Sunday. Competitors packed six hours worth of racing into just two, which meant plenty of work for the stewards. They reviewed 64 protests or other incidents during the race, and while only a few resulted in stop-and-hold penalties for on-track contact, Hekkens noted that they saw plenty of risky and worrisome maneuvers. A crowded circuit both on track and on pit road. And it wasn’t just one class to blame. Within the first 16 laps, one team in each class had been penalized for avoidable contact with a car from a different class. To the teams’ credit, in a race where on-track behavior went just as far as performance in determining their fate, they could have driven over-cautiously. Instead, they embraced the pre-qualifying event for its intended purpose — as a true race with all the same consequences for rough driving as in a standard NEO event. For that reason, Hekkens said the decision to add a race to this season’s pre-qualifying schedule proved useful. With this year’s expanded two-round pre-qualifying, the teams involved may feel like they’ve already experienced enough stress and excitement to fill a full season. However, we’re still a little over three weeks away from season five beginning in earnest. While Silverstone might have become the new home of NEO’s prologue, all eyes now turn to Sebring — the traditional starting point for the Endurance Series championship. The 55 teams who will challenge for this season’s titles will soon be locked in, and if the first two hours of racing in pre-qualifying is any indication, it may be NEO’s most exciting and competitive season of competition yet.